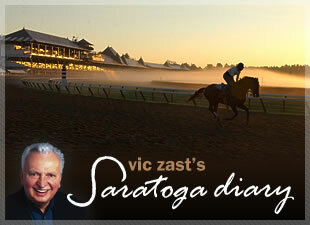 Saratoga Racecourse isn’t the site of the world’s best Thoroughbred racing anymore – in fact, it’s far from it. Today marked the beginning of a four-day Travers Stakes push and five races, the conditions of which enabled claiming horses with price tags of $35,000 or less to run, were on the program. Thursday and Friday will offer the same mediocre fare, although Travers day will resemble the kind of across-the-board quality that Saratoga used to be famous for. Some purists contend that lumping three noteworthy stakes on Saturday’s card for television purposes is being acquiescent to crass cupidity. These fans would have preferred to be treated to the King’s Bishop (gr. I) or the Ballston Spa (gr. II) instead of the Bennington or the Albany on Wednesday. Nevertheless, there were festival qualities to the afternoon that made up for the fall-off. Weather-wise, skies were blue and humidity non-existent. There was mild curiosity in the two maiden special weights races and in a second-level allowances skirmish. The turf-handy Relatively Ready, a horse that is missing one eye, zoomed by the favored Umbra to light up the tote board in the second. In the third, Pretty Carina had a clear lead with less than a furlong to go before swerving starboard. That move allowed Awesome I Am to win a seven furlong sprint. The Phipps Stable’s Consequence showed an impressive turn of foot in the fifth. Trainer Shug McGaughey rarely sends a runner out that breaks her maiden without any experience, so peg this one as unusual. In the two stakes, Godolphin’s Zada Belle, at 3-5, won the $80,000 Bennington. Tin Cup Chalice, the undefeated (eight for eight) gelding from Finger Lakes, won the $150,000 Albany. In capturing the Albany, Tin Cup Chalice picked up a check for $250,000 extra. Despite running so slowly that he made clockers drowsy, the 3-year-old New York-bred became the first of four horses in the last 10 years to win the final leg of the Big Apple Triple after winning the first two. After the races, one of the season’s most-anticipated parties took place at the City Center. The Belmont Child Care Association’s Western Round-up proved that informality has gained traction. There were over 400 A-list guests in attendance, spurred on by the casual dress requirement. At $15,000 for a business-class trip to the Japan Cup, Tommy Roberts of Miami, Florida topped all bidders in the Round-up’s live auction. Susan Moore of Far Hills, New Jersey quit her bidding on a Gator at $9500. It sold to Robby Albarado for $12,000. Later, Moore bought $200 in raffle tickets and auctioneer D. Wayne Lukas pulled her lucky number for a 2008 EZ-GO Sport 2x2 vehicle. Tomorrow night, the Travers Ball stands in contrast.